It’s easy to get wrapped up in the hustle and bustle of the holiday season–the obligations, the shopping, the preparation. It’s also easy to completely miss out on the true meaning and spirit of Christmas. So how do you fulfill those obligations, observe family traditions, and still experience the joy and wonder of such a beautiful holiday? I suggest making an Advent calendar or Christmas bucket list filled with activities that will help you appreciate all that comes with the month of December. We made an Advent calendar for the girls in 2014, when they were a little more than a year old. We wanted to countdown the days until Christmas, introduce them to our traditions, and teach them about the reason for the season. I had these envelopes printed at a copy shop in 2014 and have used them every year since then. I hang them on a decorative clothespin garland in a place of prominence. I make a list of things we want to do in preparation for Christmas–things like watch “A Charlie Brown Christmas,” donate to Toys for Tots, bake cookies, decorate the Christmas tree, and make gifts for the girls’ caregivers or teachers. I’ve always made sure to include family traditions, charitable acts, crafts and/or gift-making, special treats, and movies. Then, I print a blank December calendar and strategically schedule out our activities, based on when a particular event might be happening, or when a charitable organization needs donations, etc. Once it’s all planned out, the setup and execution are really easy: Print (or write) out the list of activities, and cut out each activity; place each one in its corresponding envelope. Then, hang up or display the Advent calendar. Finally, open up the envelope on the corresponding day and enjoy 24 days of heart-warming activities with your family. Pro tip: Keep the December calendar handy, so you can prep for the next day’s or week’s activities and generally stay on top of things. Look for local Christmas events, such as visits with Santa Claus, Polar Express train rides, and movie showings. Think about the things you did as a child to celebrate Christmas. Consider also the things you might have to do (e.g. shop for or make a teacher gift) and make them into family activities. Think of those less fortunate and make an effort to help them. And of course, remember the reason for the season. For February, we’re “learning” about Valentine’s Day, about heart shapes and the colors red, pink and white. 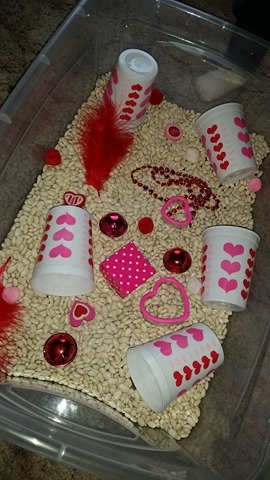 This box contains red and pink jingle bells; red, pink, and white pom-poms; red feathers; red and pink heart-shaped Mardi Gras beads; Valentine’s Day erasers; small pink jewelry boxes; heart-shaped cookie cutters; and white, heart-pattered plastic cups. Everything came from the dollar store (thanks, in part, to my mother-in-law) or my arts and crafts stash. I think this might be the girls’ favorite box yet. 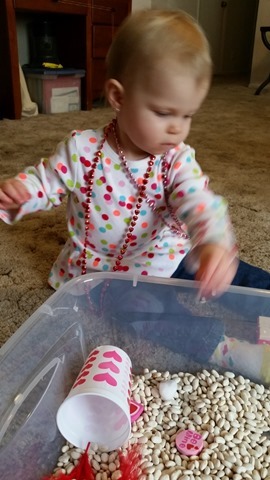 They love wearing the beads and transferring the beans from the big box to the small boxes and cups, or putting the jingle bells in the cups and shaking them around. 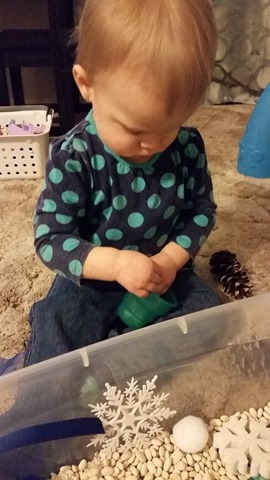 They also love stacking the cups and nesting them inside each other. They’re doing a much better job of keeping the beans contained to a confined space, rather than throwing them about…although they do still do that, too. 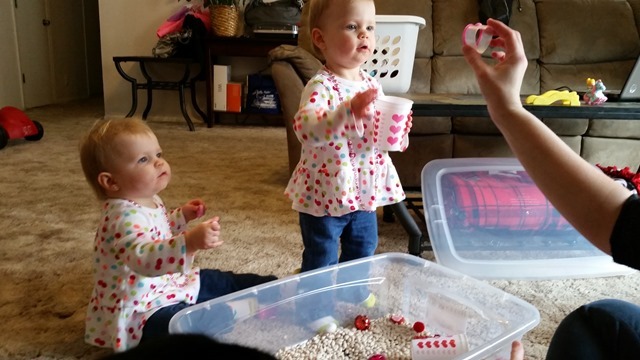 In searching for age- and developmentally-appropriate arts and crafts projects for the girls to do (and for us to do with the girls), I stumbled upon the concept of a sensory box. 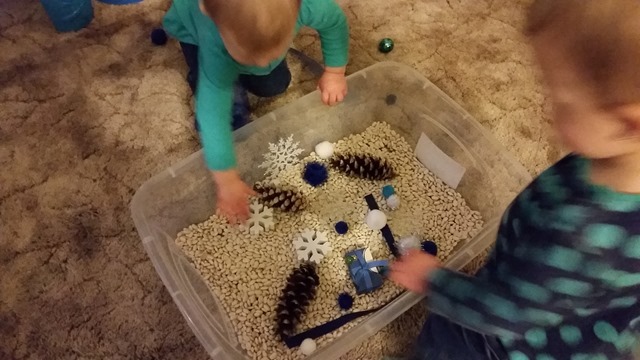 A sensory box is simply a medium-sized shallow plastic storage tub with materials inside that stimulate the senses and, hopefully, spark the imagination. 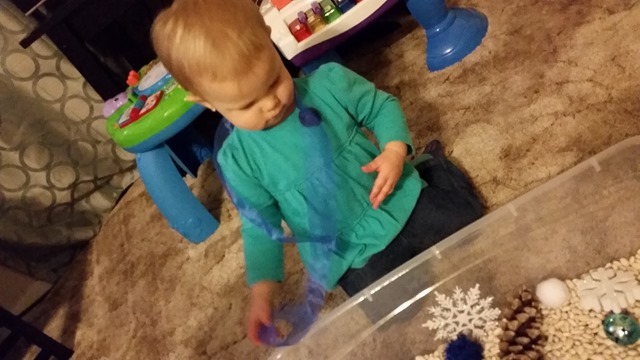 A sensory box is often built around a central theme or concept. A box has three components: the base, the tools, and the treats and trinkets. The base often is dry beans, rice or pasta (plain or dyed), sand, gravel, or similar “filler” material. The tools are things that can be used to scoop, pour, pick up, sort, etc. ; they could include measuring cups/spoons, small boxes/containers, or chopsticks. And finally, the trinkets are things that make the box fun and usually fit the theme. I had read that sensory play not only is good for developing fine motor skills, but also good for developing child-directed creative/imaginative play. 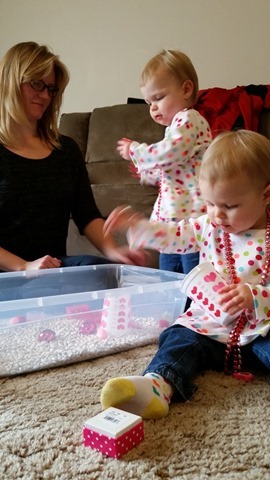 I learned that they also can help with developing language and vocabulary, improving focus, and, because they stimulate the five senses, tearing down barriers to everyday “tasks,” such as eating. I was 100 percent sold on these things. I figured the investment of money, time, and effort was minimal for the outcomes. I pinned several ideas. And I had many more churning through my head. After a trip to the dollar store and a hunt through my craft supplies, I put together two very simple boxes: one around the theme of Christmas and the other around the theme of winter. The Christmas box contained red and green jingle bells, red and green pom-poms, ribbons, foam gingerbread men and reindeer, a small jewelry box wrapped like a present, small plastic containers filled with plastic cranberries, and Christmas tree-shaped measuring spoons. 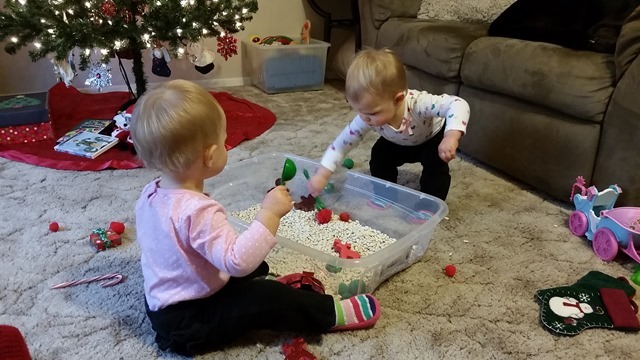 I gave it to the girls pretty early in December, and they played with it for at least 20 minutes at a time for about 5 days straight. I left it out in the living room, among their other toys, and they would ask me to open it so they could play with it at least once a day. 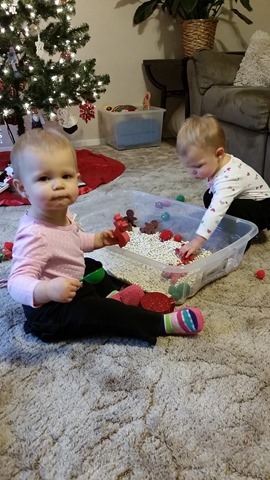 They put the dry beans in their mouths every once in a while, and they flung the beans all over the floor quite frequently, but they were just so darn happy, it was hard to be upset. 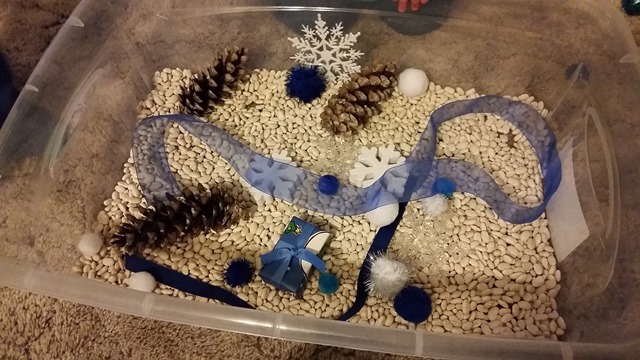 The winter box contains blue jingle bells, blue and white pom-poms, ribbons, foam and plastic snowflakes, a small jewelry box wrapped in snowman paper, and pinecones. I forgot to initially, but I later added a couple of plastic cups. I gave the girls the winter box for a while yesterday, but they already seem to enjoy it. They were taken aback by the texture of the pinecones and the snowflakes. Anna enjoyed rubbing the ribbon on her face and wrapping it around herself like a scarf, while Elise loved feeling the pom-poms on her face. 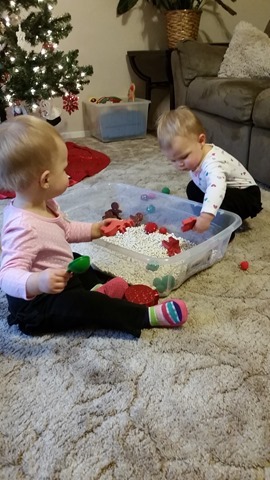 They also figured out how to “sort” the beans into their cups, rather than just throw the beans around the room. I plan to make a Valentine’s Day-themed box for next month, focusing on red, pink, and hearts, and a St. Patrick’s Day-themed as well as a spring-themed box for March, focusing on green (the former) and flowers, grass, and sunshine (the latter). I’ll be sure to post photos of the boxes as they are made. 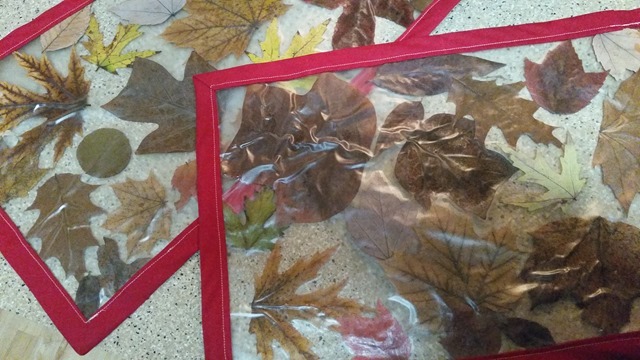 I have a really easy fall craft that parents can do with their children: pressed leaf placemats. 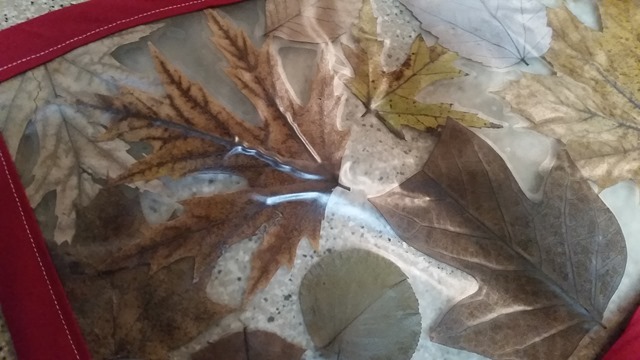 These remind me of the leaf pressings we would do in Girl Scouts – where you seal pretty leaves between two pieces of waxed paper. Anyone else remember making those in Scouts or in school? Well, this is an easier (no iron necessary! ), littler-kid-friendly version! First, we went on a walk around the neighborhood and collected leaves of all types, sizes and colors, as long as they were not torn and not too brittle. Next, we cut out a piece of Contact paper to the size of a placemat, peeled off the backing, and laid it out on the table sticky side up; we held it in place using painter’s tape. Then, we helped the girls place leaves face up and face down all over the sticky paper. Anna and Elise were about 15 months when we did this craft, so they picked up leaves and held onto them; they didn’t really lay them neatly on the paper. 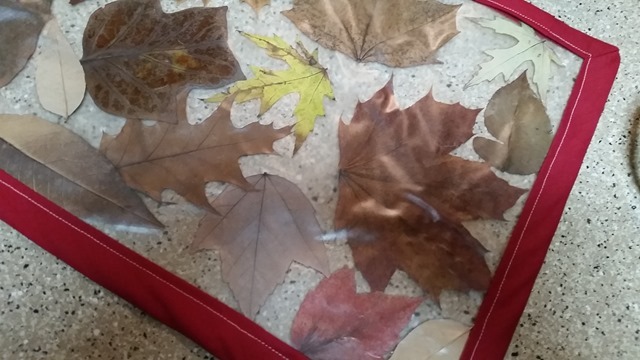 We guided their little hands, though, and managed to lay out about a dozen leaves on each placemat. Last, we cut out a second piece of Contact paper, exactly the same size, peeled off the backing, and laid it on top of the first piece, sticky side down – sandwiching the leaves between the adhesive sides of the Contact paper. I opted to sew double-fold bias tape around the placemats to give them a nice, finished look – and, in part, to match our existing placemats, which are a rich brick red color. I used this tutorial to sew the bias tape with mitered corners. It is not at all necessary, but it sure makes for a polished look with relatively little effort. 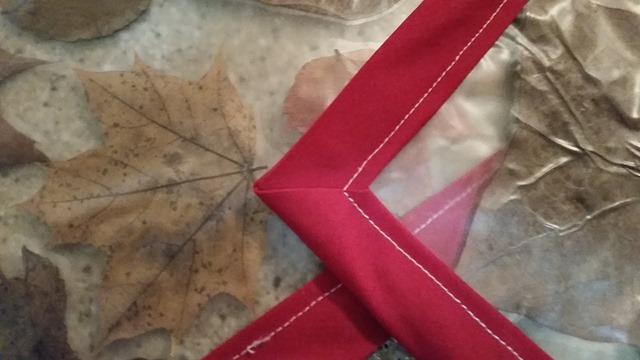 Over time, the placemats might bubble up a bit, where the adhesive doesn’t stick well to the leaves, but they still work and are easy to wipe off! And they are so stinking easy and adorable! These placemats were a great addition to our Thanksgiving table and would be lovely for everyday use in the fall months. Christopher and I made a pact that if the girls could walk up a driveway, up to the front door of a house, by Halloween, then we would take them trick-or-treating around the neighborhood. We needed costumes that were simple, inexpensive and totally adorable. 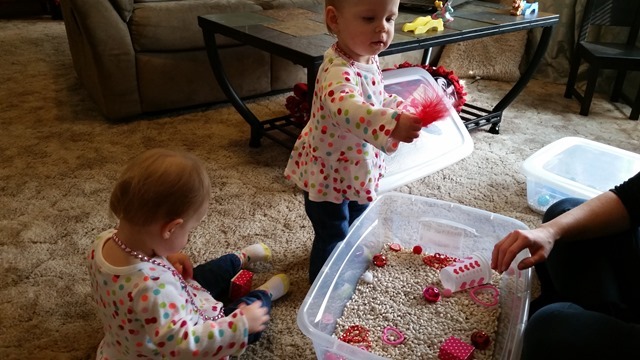 A quick Google or Pinterest search reveals some pretty cute ideas for twins, but none of them really struck our fancy. They say little girls are made of “sugar and spice and everything nice.” Christopher and I wanted to make Anna and Elise into sugar and spice. Sugar: White pants, white long-sleeve shirt, silver headband, silver glitter fabric paint, silver glitter hair and body spray, and three sugar cubes. 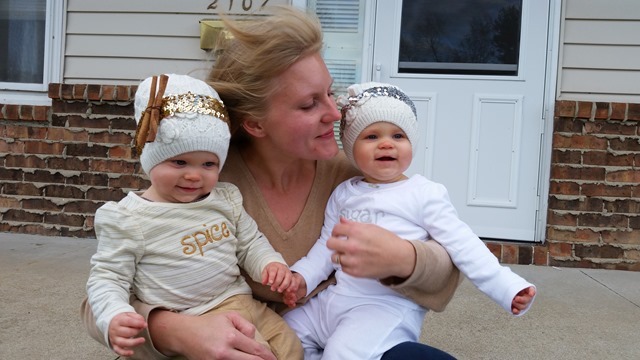 Spice: Gold pants, gold long-sleeve shirt (I found one at Target that was ivory with sparkly gold stripes. 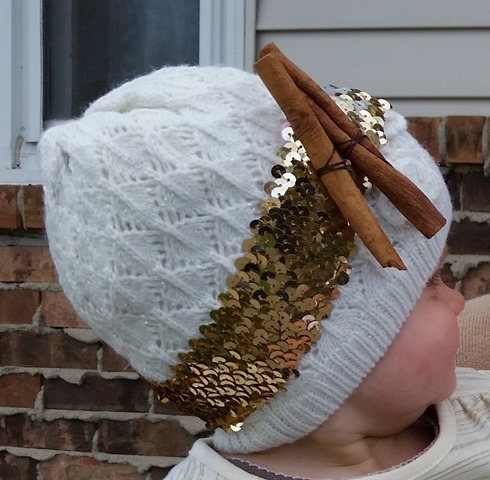 ), gold headband, gold glitter fabric paint, gold glitter hair and body spray, and two cinnamon sticks. Step 1. Spray the pants and shirts with the glitter hair and body spray. (It will not stick permanently, but it will add just enough glitz and sparkle for a couple of hours of Halloween fun.) Let the clothes dry for a bit. Step 2. 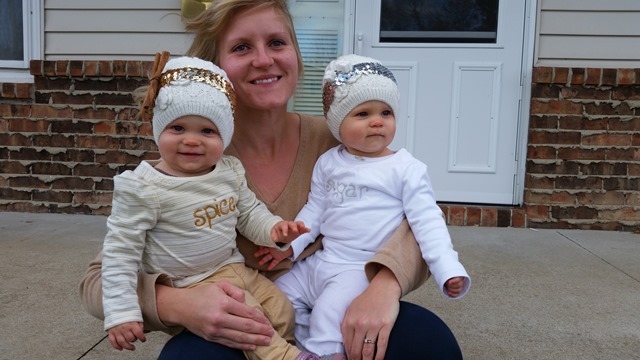 Paint the words “sugar” and “spice” on the respective shirts with the fabric paint. Let the paint dry according to the recommendations on the bottle. Step 3. Affix the sugar cubes and cinnamon sticks to the respective headbands using a needle and thread or, if you have it, hot glue. Step 4. 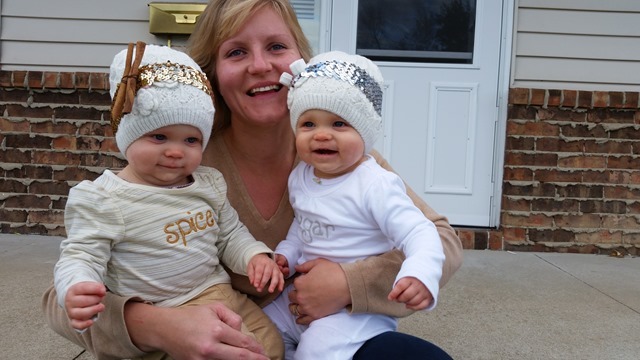 Dress your little ones, stand back and admire the adorableness! 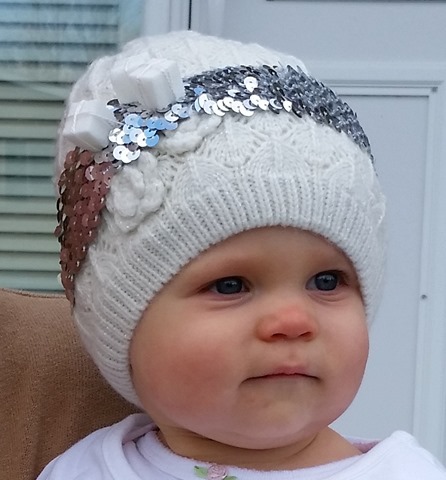 We got the girls bundled up in their hats and mittens and put them in their wagon with a blanket, and we made it to about three houses on our side of the street. The wind was whipping. The temperatures were deceptively cold. 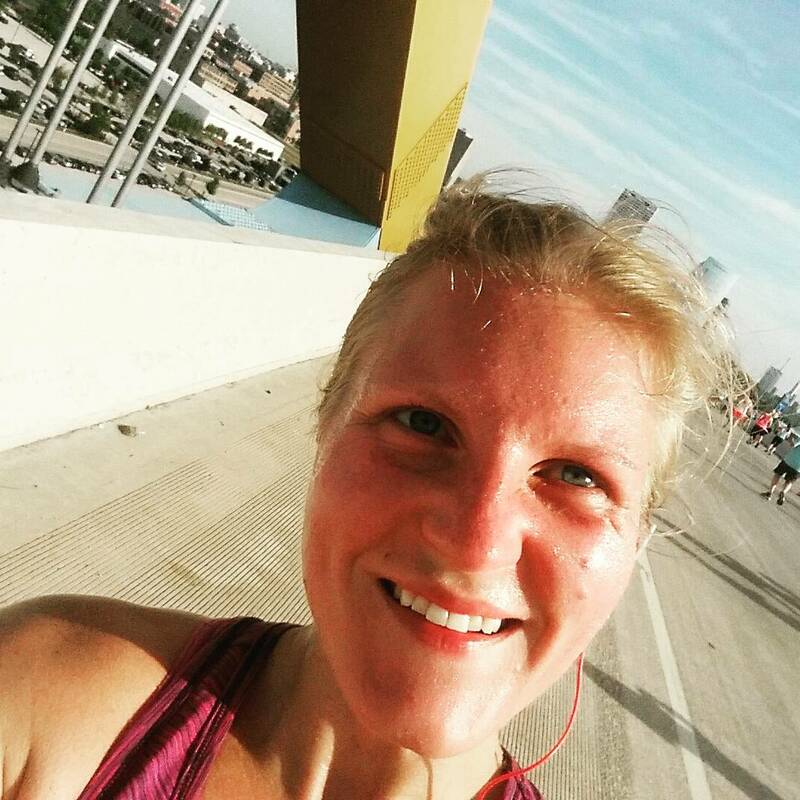 The girls faces were red and their noses were running. We called it quits. But, Christopher and I got these wonderful photos and made a sweet, silly memory. That’s all we could ever ask for.